Non USB based NAS boxes that are attached via Ethernet Cable (and probably a few of the WiFi ones as well) may rely on SMB1 to read/write/view files over your home network. Some vendors have firmware upgrades for some of their products that change the minimum SMB requirement to exclude SMB1. The gotcha is that some of the first generation NAS boxes are being ignored by vendors. 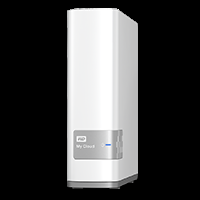 I personally had this experience with an original Western Digital My Cloud NAS box (I replaced it with a newer version); and I believe that the WD My Cloud range of products is the most widely used for entry level home NAS. So if you try to browse files on your NAS box and windows throws an error message, see if you can update the firmware. You can update the firmware in a WD My Cloud device from the web interface. Go to http://wdmycloud/UI/ (log in if necessary). The firmware version will display and you will be able to update if needed (except on a first generation device). Alternatively, you can visit https://support.wdc.com/product.aspx?ID=904#WD_downloads and select Current Firmware after you have determined from the GUI if you have a 2.X version of a 04.X version. Version 2.30.165 (04/12/2017) utilizes SMB-3 by default; Version 04.05.00-315 (04/12/2017) also utilizes SMB-3 by default. If you have a NAS box from a different vendor, you will need to check with that vendor if you no longer have access after disabling SMB1. Most modern routers have at least one USB port that can be used to attached external USB drives or printers. These aren’t broadly used by non technical home users because the steps to configure these devices are a little complicated. 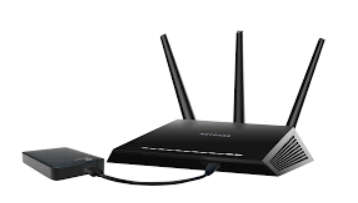 Additionally, the transfer speed between a computer and an external drive attached to a home router is slow compared to an external hard drive attached to a computer. If you are one of the few folks who have this configuration, it will probably stop working when SMB1 is disabled on a Windows computer. Attach the portable drive to your computer and move on. 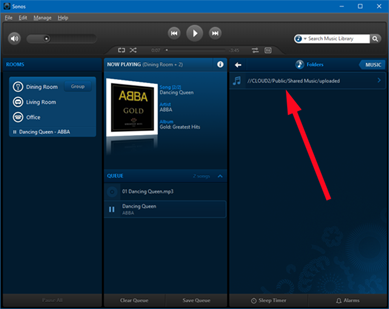 I love my Sonos speakers and am infuriated that the folks at Sonos have been stalling for two years plus on updating a specific function that requires SMB1. 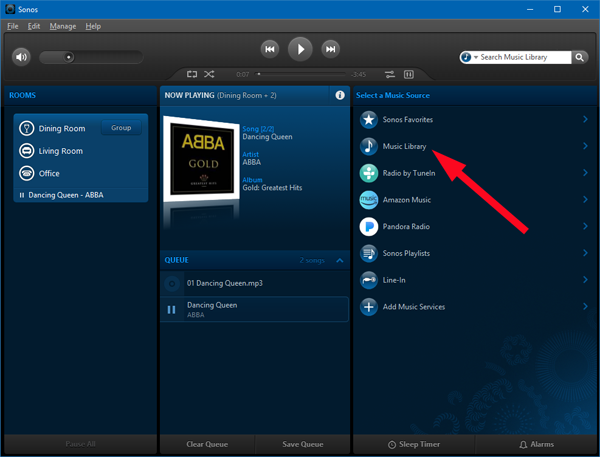 And I’m not alone in my aggravation at Sonos for their seemingly unfriendly attitude on this issue. 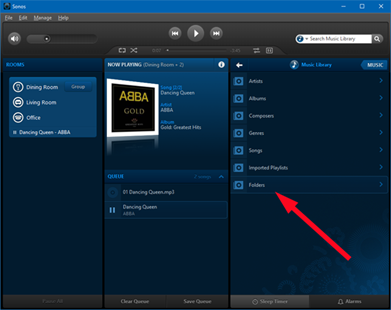 Many folks use Sonos primarily to stream from online music sources these days, but there are still those who keep local libraries of ripped music on their local computers and use those to fill their homes with sound. 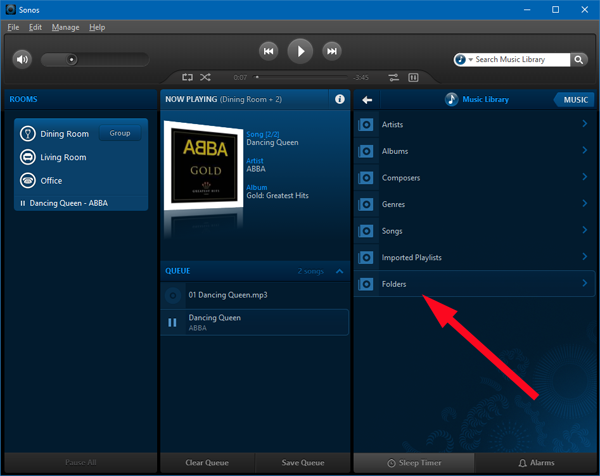 One of the functions I previously used frequently in the past (not so much these days as I stream mostly from online sources like Amazon Music, Pandora, etc.) 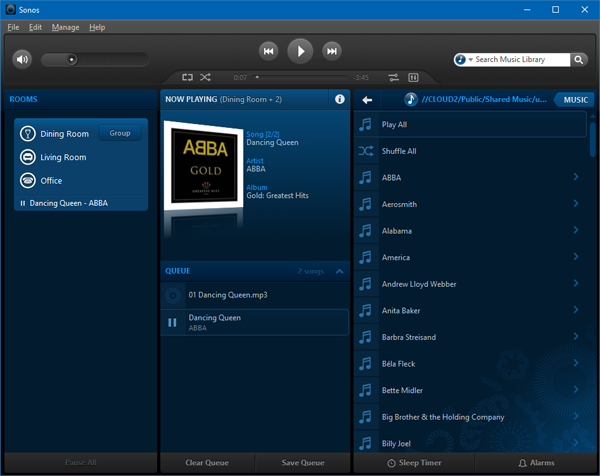 was streaming from a local PC where I had ripped all my music CD’s. I had music on a couple of the computers on my home network and I had added both to the Sonos Music Library. This is one of the things that broke after disabling SMB1. But there is a work around. I have a (newer, non first generation) WD My Cloud with the latest firmware that I’ve been using to back up my files (in addition to OneDrive, etc.). There is plenty of free space and there is an easily accessible, built in place to hold music. 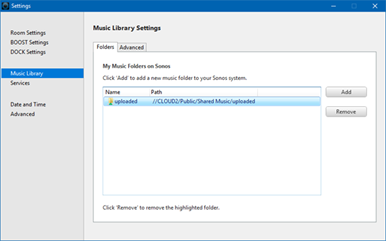 I opened two Windows/File Explorer windows and copied everything from my Music folder to \\wdmycloud\Public\Shared Music\ (you can just paste that into file explorer as long as you didn’t change the name of your My Cloud device and it should open). Once everything was copied, I opened the Sonos desktop controller and navigated to Manage, Music Library Settings. 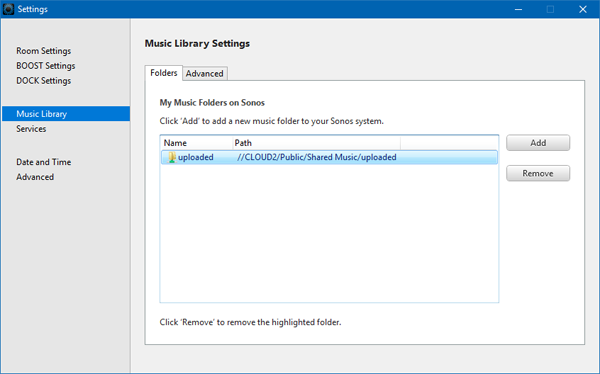 I was then able to add the folder from my WD My Cloud using the Add button (and I removed the old entries pointing to the two individual computers). Don’t be confused by the word “uploaded” in the path shown below, I added a few things to the file structure so there is a subfolder called uploaded in the path that you won’t see (or need) if you do this. 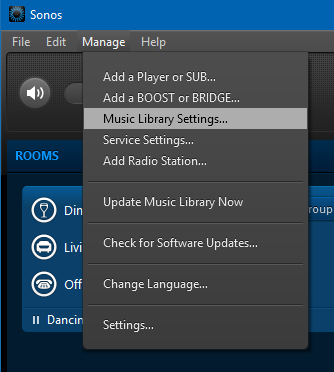 Then, I went back to the Manage menu on the Sonos Controller and selected Update Music Library Now. 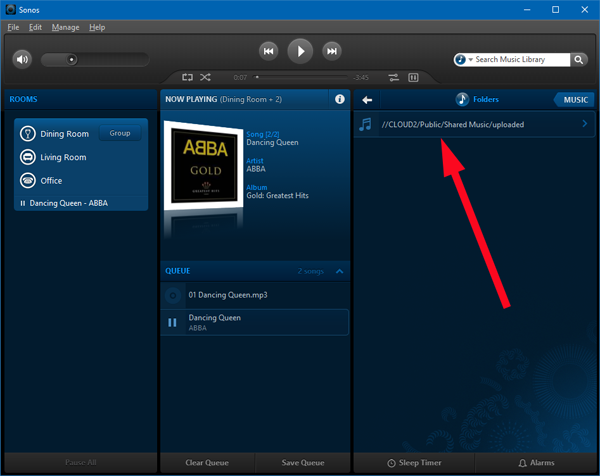 Note that Play To/Cast To should continue to work and are not impacted by turning off/removing SMB1.